Stem cell therapy is another regenerative medicine therapy that is being used to manage pain. There are two types of stem cells – embryonic and adult stem cells. Embryonic cells are taken from human embryos. Adult stem cells have restorative abilities. Unlike embryonic stem cells which can be used to treat many times of medical problems, adult stem cells are used for more specific problems such as damage to the brain, bone marrow, skeletal muscles and a few other parts of the human anatomy. The use of embryonic cells is relatively controversial. The use of adult stem cells, which use your own cells (not someone else’s) is generally not controversial. Stem cell therapy essentially uses a concentrated amount of stem cells to tissue that is damaged. This increases the likely ability of the stem cells to repair or regenerate health tissue. It is being used in different medical fields including orthopedics and neuromuscular disorders. 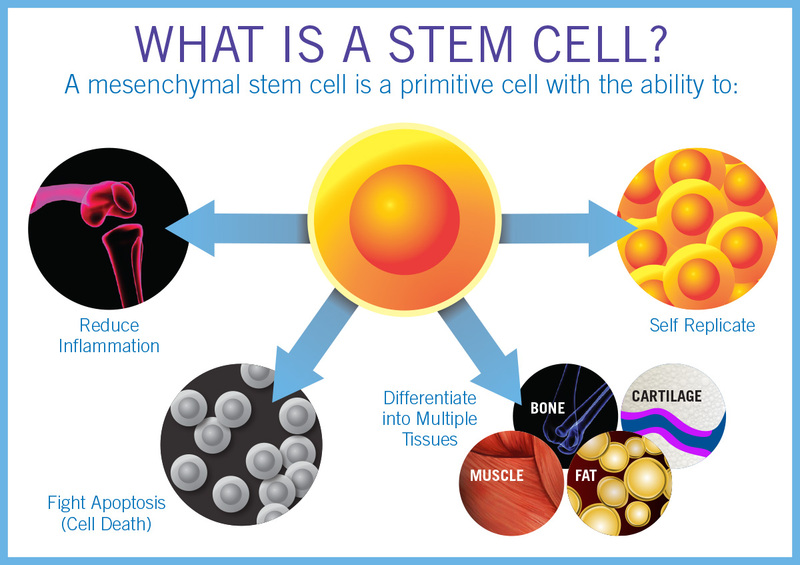 A particular type of stem cells (called stroma cells) can help regenerate fat, bone, and cartilage. These cells are currently being used to treat muscle, ligament, and tendon damage. Stroma cells are also being used to help treat arthritis of the knee and hip.Stem cell therapy is a non-surgical procedure. A doctor extracts the stroma cells from bone marrow located around your hip. A centrifuge is then used to concentrate the cells. The cells are then injected not the area of the body that is in pain – sometimes with the help of an ultrasound machine. The procedure can be done in an ambulatory setting. It normally takes about one hour.Patients can normally return to work within one day though they will be advised to avoid physical labor for about two weeks. Patients normally are told Not to take NSAIDS for a while because these medications can hinder the healing process.While the procedure doesn’t require surgery and uses your own cells, there are no guarantees. The use of stem cell therapy is still be researched for its effectiveness. Patients should review the risks of complications with their physician. Patients should also review whether insurance will or will not cover the procedure.